So the other weekend I was in Los Angeles for the Beyond Buckskin Lookbook photoshoot. In the midst of the shoot, I was talking with Nicholas Galanin about possible Lookbook ideas that Bethany Yellowtail had proposed (she was the photoshoot organizer and stylist). We pulled up Google Images and searched the term 'Lookbook.' We scrolled down, and down, and then our attention was drawn to one questionable image (left). What came up on the screen was, well, look at it. 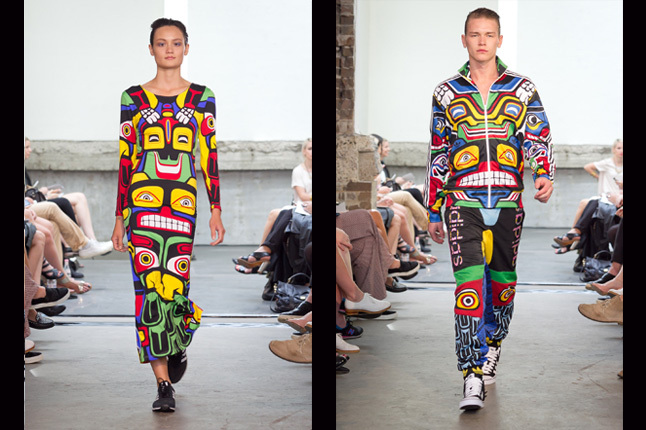 Evidently, Jeremy Scott collaborated with Adidas for a new collection, some of which was ‘inspired’ (and I use this term loosely) by Northwest Coast totem poles. Now, there are two sections to this article, and I must preface this fact. The first section briefly states, again, why these instances of misappropriation are bad. The second section gets into a straight fashion critique. 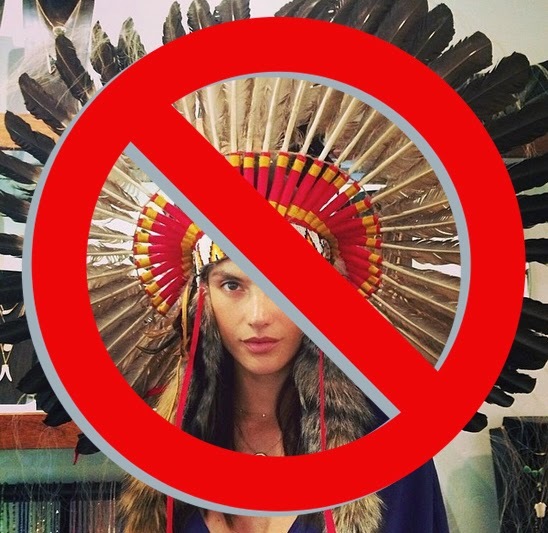 In numerous previous posts, I have brought up why cases of Native American misappropriations are bad. They are unethical, and in some cases illegal. In this case, at first we presume that Jeremy Scott was inspired by totem poles carved by Northwest Coast tribal members, but it appears instead he aimed to be in the same ballpark as cheap, non-Native-made, tourist souvenir shop, Taiwan-made, knock-offs. His (above) lacks the sophistication and knowledge that is evidenced in the pole to the bottom right. 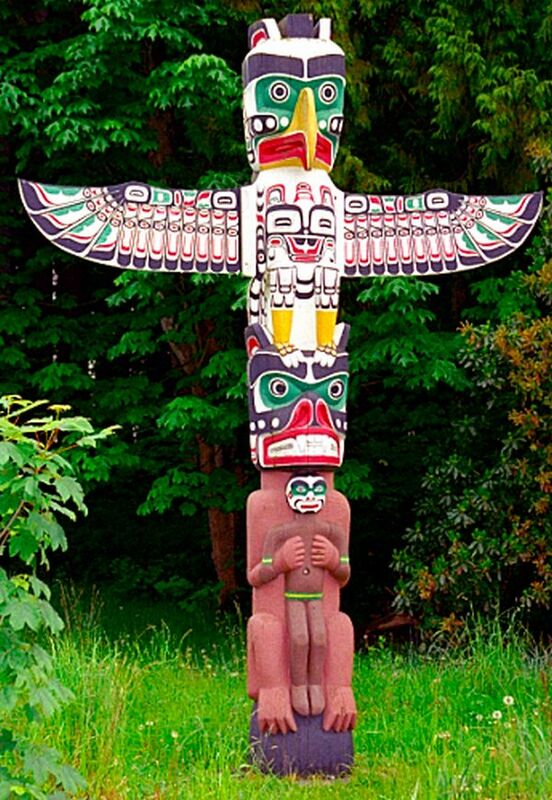 Totem poles tell stories, and relay information about our lineage, heritage, and history. They tell important stories about who we were and who we are now. The images on these poles are owned by the various families and clans they represent, and unauthorized copies are seen as infringements upon rights. At the turn of the last century (and the 50 years that followed) family-owned totem poles were chopped down without authorization and relocated to museums throughout the world as relics of dying cultures. They were also relocated to parks where they became tourist hot spots, and miniature Native-made totems were sold. Later, Native artists were excluded altogether, and the souvenir-making was outsourced and cheap knock-offs filled the shelves of dimestores, gas stations and tourist shops - negatively impacting public perception of the artistry and talent of totem pole carvers. 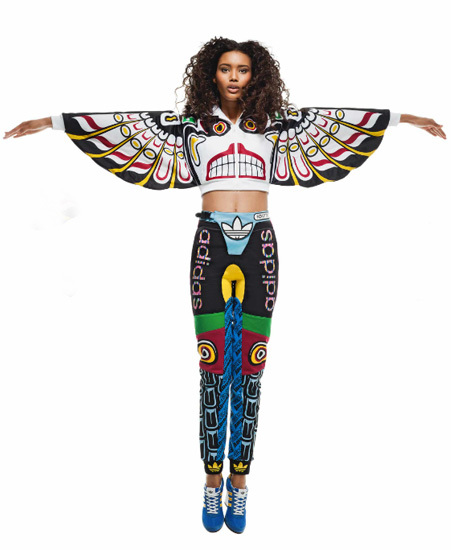 People like outsourcers and Jeremy Scott greatly affect non-Native people’s perceptions of Native American art and aesthetics. They also impact our economies. Back in the 1920s and 1930s, non-Native ‘friends of Indians’ noticed that the creation and marketing of Native American arts could have a positive economic impact in Native communities. Thus, the Indian Arts and Crafts Act was enacted to protect Native artists against people who falsely suggested that their artwork was Native-made. 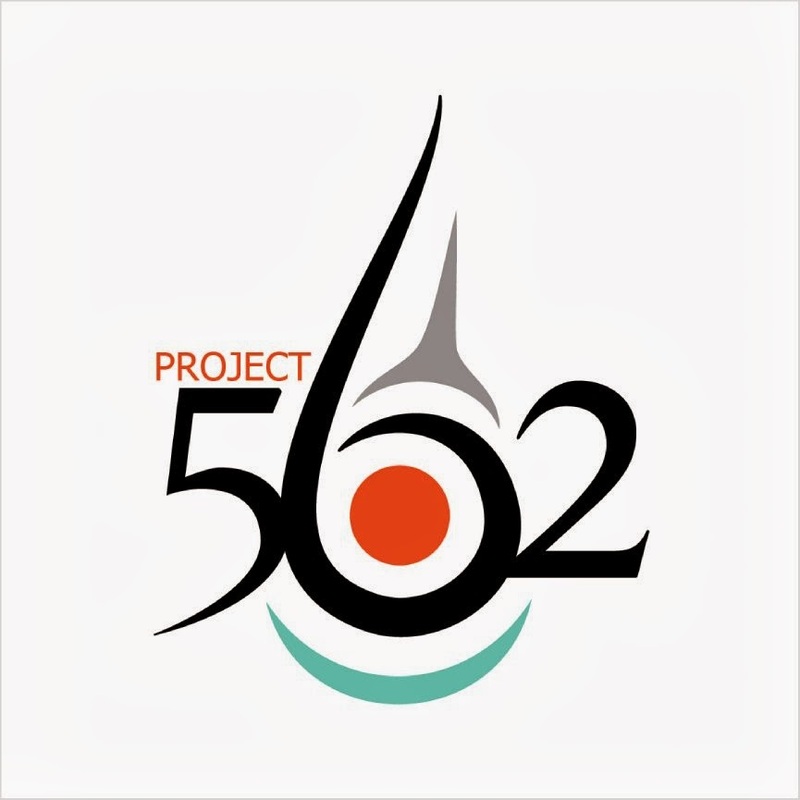 This act sought to help protect Native artists who were working to bring money into their communities from companies who would mass-produce cheap knock-offs, and thus produce unfair competition and redirect money into the pockets of a few versus back to where the money was needed to continue these important living artistic cultural practices. Over the years, the IACA hasn't always been supportive of Native artists and has lost a lot of clout - big companies with big lawyers find ways to circumvent our rights to our cultural capital, imagery and names. Furthermore, the jury is still out on whether or not 'fashion' is considered 'art,' adding another potential loophole to the mix. I apologize for the longwindedness, but this legacy is important to note since it continues to affect us today. When companies like Forever 21, Urban Outfitters, or Adidas put out tacky images like this, they perpetuate the idea that Native art is in the free bin (as if we have no sense of ownership or artistic legacy when it comes to our art), and anyone can reach in and grab it, tack their name on it, and make a buck - all the while putting forward the idea that our art is ugly and cheap. 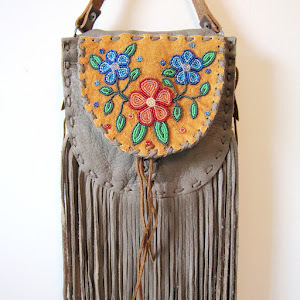 There appears to be a recent trend in fashion for companies, 'artists,' and lame designers to bite Native style and fail. If you’re unfamiliar with the term ‘bite,’ let me share the definition: this word can be used to describe an instance of someone taking, stealing, copying, or imitating another person’s style, usually in a way that is of lesser quality and is displeasing. And that my friends is exactly what is going on here. Jeremy Scott (and Adidas): You are a cheap, cheesy biter. Bizarre, garish, unpleasant and disgusting were several terms used to describe this outfit by people in the Native American community (and what's with that distasteful neon yellow crotch?). Several individuals noticed that his inspiration was unoriginal, and that his take on Northwest Coast formline was ignorant, disrespectful and badly construed (in other words, Scott needs to work on his ovoids and u-forms). He produced this collection with little to no knowledge of the complex stylistic conventions of Northwest Coast. Designs such as his actively work to reduce public respect for the deep cultural knowledge and artistic skill needed to design, create, and carve a pole. This last statement is particularly important because one reviewer noted that Scott's collection was all about "expanding your cultural horizons." No, it doesn't expand our cultural horizons, it's just lazy work. Thank you! Well said, and very timely for me. I will be presenting to a couple of teacher groups in Nebraska, and will embed this into my PowerPoint. Amazing piece. I had no idea.... I will know the next time I see this in a store because it speak to the level of ignorance in our society.... people would like to forget the injustices and the past that native Americans have endured.. but to forget and to live in denial is to deny justice to the very people affected. Here from Racialicious, nothing to add except thank you for the educational read. I completely agree, this reappropriation (or is it misappropriation) of Native culture is disgusting! As a blend of Scot-Irish and Eastern Cherokee, I often find collections like Adidas offensive, but they might also be trying to honor the beauty of creativity of Native Americans by "cherry-picking" the designs. Would you find it so unpleasant and distasteful if you could participate in the profits of these endeavors? Those outfits are SUCH crap!! 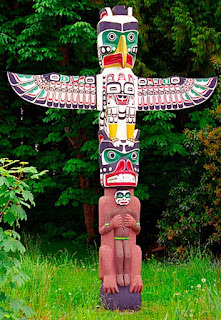 They are the latest really bad appropriations of my grandfather's totem pole, which is the most photographed and appropriated totem pole at Stanley Park, Vancouver, BC. My grandfather's name was Charlie James - Yakuglas; and I'm sure he would have shook his head at that pathetic, yellow-crotched outfit! I included this photo in all my art-school presentations last year...glad that most other students got what I was saying about appropriation. These outfits are beautiful, taste is subjective, and all the cognitive dissonance of the social justice crowd in terms of who has a right to inflict their subjective judgements objectively on the masses are laughable. Attempting to dictate the inspiration of artists and claiming you are hurt by art that is very plainly by non-Indians for entertainment purposes only goes to show that people like you are weak and do not deserve to be humoured if your existence is so terribly threatened by freedom of expression.